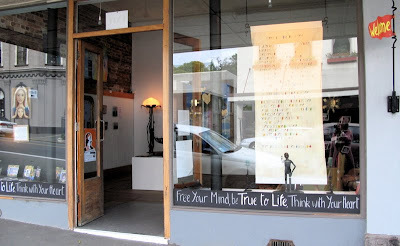 ‘Free Your Mind, Be True To Life, Think With Your Heart’ are the words written on the bottom of our new studio-gallery’s windows in Port Chalmers, Dunedin. In the right window the passersby can read Peter’s poem ‘There’s only one of us here’, click here to read it. ‘Charlie number 2’, a little boy sculpted in mild steel is standing in front the scroll of the poem, offering a flower, a symbol of his love to everyone. Unconditional love it the only condition needed to live in truth...that is to be free! what an amazing studio gallery you have.. i loved every bit. your such amazing warm and wonderful souls... a sure treat to our shore.